No information for Arthur S. Teague could be found in the Official Army Registers of the period. From other sources we know that he was a Lieutenant in Company G of the 22nd Infantry in 1940. 3rd Battalion 22nd Infantry. He led the Battalion ashore on Utah beach on D-Day. He was wounded in action on November 17, 1944 during the Battle of the Hürtgen Forest. recommended for the British Distinguished Service Order. of the Regiment in 1946. His time of command was approximately one month. The longest surviving battalion commander of the 4th Division commanded the 3d Battalion. Teague would look at the map from every angle for about fifteen minutes and then issue very precise orders. the battalion operations officer, were products of the pre D-Day regiment and ROTC graduates. on the assault landing of the Third Battalion. "From landing craft we came ashore on LCM's (Landing Craft Mechanized) - three of them - operated by Navy enlisted men. the initial landing so much as he did the ones afterwards because he would have to keep bringing in supplies. of boats behind us - about seventy-five yards back in the water - were hit, and then I saw a number of casualties. Many were killed and quite a few wounded. I started up by the sea wall on the sand dunes and stopped for a moment, and it was then that I heard someone call me. my men immediately after landing, and asked me to get them down the beach as soon as I could. This was about 0930. At this time we were getting quite a bit of artillery fire from the inland side of the beach. It was not very heavy, but spasmodic. Samuels, the Company Commander, and see what troops were already on the beach so that we could take stock of them. coming ashore, and that was all. I told him for God's sake to start fire so we could reduce the troops waiting for us. He said he had orders to defend until the troops went through. on the sand dunes, but someone yelled at me that snipers were firing and for me to come down. and were having quite a little rifle fire back and forth. I saw what was happening as they moved along. My German interpreter was with me. We ran and hollered to them and he yelled to the enemy in German. from different places around and started running across the beach. Pvt. Meis yelled at them in German. they didn't know - that they had come only the night before. I told them they did know and that they would go with us. I then started a skirmish line up the beach. They went about fifty yards. up the beach and yelled. "Mine !" and while he was doing it, to have his engineers go up ahead and to lift out any mines. and opened fire, knocking the turret completely off the little fortification. Here we got quite a few more prisoners. another steel gate of the Belgian type near the beach. It had been used quite a bit by vehicles before we landed. the gates out and he opened that entrance. I waited until he finished the job. that that wasn't going to do any good because we weren't getting any of the other fortifications. and fired two shots. One went over our heads and hit the water. The next one ricochetted off the tank which was close to us. We called for another tank. Firing continued from the S-9 fortification. causing quite a few casualties. Our tank fired a few rounds at it and finally destroyed it. American paratroopers from that same pillbox. as we went. I told them to step in the same tracks that I had made. As we walked I heard one explode behind me. Captain Williams hit it and he got it through the cheek of the buttocks. thirty minutes. I yelled for Captain Ernest to get him to hold L Company because I wanted to send K Company into attack. the embrasures, but the Germans had destroyed it themselves. was being used, and, to the best of his knowledge, was not mined. because he couldn't be evacuated. supposed to be a flame thrower behind the house, so I sent the Lieutenant out. Then we went on up the beach and hit the causeway. We were getting quite a bit of fire and also quite a bit of mortar. that we couldn't make much more distance, and we made preparations for the night. to give up an inch of ground. We put two machine guns on the causeway, and there was water all around us. It was about 1:00 A. M. before all was quiet. Then we began to make plans for an attack at 4:30. We worked out the plans on the map. the beach road. He worked all night. A machine gun kept him from removing them as fast as he could have otherwise. He had to work on his stomach all the while, but before daylight he got the road pretty well cleared. After daylight he had all the mines out. slept behind. All during the night a machine gun had been firing at the embankment, about two feet over our heads. Lt. Etta and showed him where the two guns were to go - one on the causeway and on behind the embankment. I pointed out the fortifications and told him I wanted the guns to be able to fire on them direct. I also got a tank. The larger guns had been knocked out during the night. of machine guns from these men, because the Germans fired on him instead. smoke from 4.2 from Captain Williams and got K Company out of the water - what was left of K Company. By that time we had cleaned out two or three houses on the beach. It was approximately forty yards of dry beach. We got two machine guns in the houses. They began firing on the fortification about three hundred yards away. possible to get the fortification to surrender, but it did not. with I and L Companies. We went out on the beach and started to Ravenoville. Coming off this area from the water side from our position there, we had captured about twenty prisoners. that they would surrender if we could get to them, provided that one of the officers hadn't taken command. up white flags, that the officers had fired on them and that they had fired back. about supplies. We left a medic to take care of the wounded. We marched the other men to the Regimental Command Post. so that water would flow across the road. During the night we got tanks to come down to our place on the beach. Staying with me that night were Captain Bridgeman, Captain Gatto, Captain Walker, and Captain Huck. we had captured prisoners. but which did not surrender. We slept in a blown-up place on the beach wall. of the beach. We were ready to begin the assault when I was ordered to report to another place to help ward off an attack. ackack also. We had some casualties. Our machine guns fired at them, but we couldn't get it stopped. beside me in the tank and adjust his firing. He did so and they directed a great deal of fire. It was hit on all sides. We got off about eight or ten shots from the tank and hit the back door of the fortification. We tried to shoot the entrance. About fifteen Germans ran out and across the field but were stopped after about fifty yards when the tank fired two rounds at them. and fired at the second fortification. We got off about ten rounds more before they ceased their fire. I had the tank placed so it could catch any fire, and after I got the men across I jumped on the tank and we got through O. K.
Going out we stopped and fired at pillboxes alongside the road. 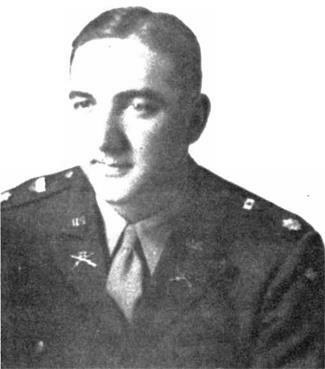 and men, Art Teague was loved and respected by the Twenty-Second Infantry Regiment as were few men. and the men were glad that he was thus honored.